Merry Graham is a Southern California award-winning home cook, published author, grandma to 6, and an all around Foodie! She has appeared on Food Network’s Clash of the Grandma’s (2015), as a top 3 finalist on The Rachael Ray Show’s Great American Cookbook Competition (2014), and on the World Food Championships (2012 – 2015). In 2012, Aetna and Bobby Flay named Merry the “The Healthiest Cook In America” – and splashed her face, title and dish across the marquee at Times Square! A self-taught cook, Merry was introduced to the enjoyment of culinary challenges in her early twenties when she volunteered to cook daily lunches for 40 workers at her church. The challenge came as Merry opened a mystery day-old box of ingredients donated from a local commissary. “I was doing Chopped before Chopped ever existed!” she jokes. Talk about a supermom, in addition to getting three meals-a-day on the table, Merry home-schooled all of her children from grades K-12, founded support groups, and ran a successful swimming school, Merry School of Fish, for 15-years. 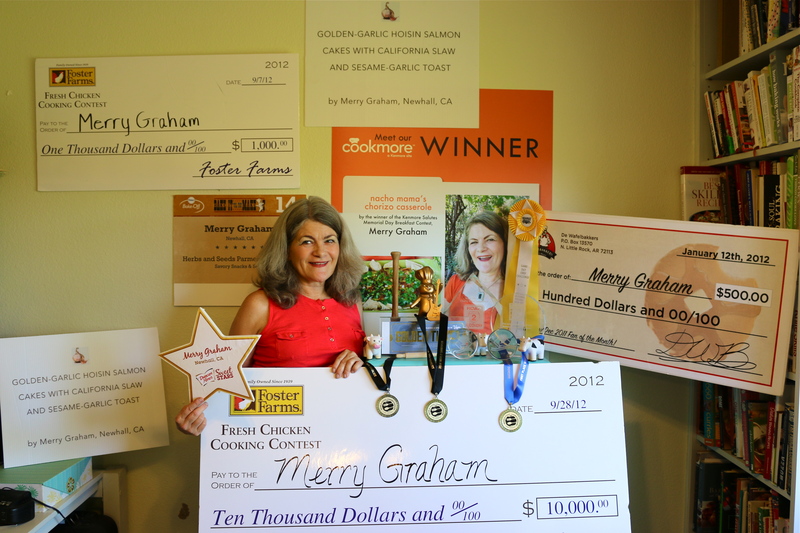 In 2009, Merry discovered the world of competitive cooking, ironically through an essay contest. She entered, and won, an all-expense paid trip for two to the Aspen Food & Wine Festival, by submitting a paragraph on how she “lives in the green”. Merry states, “While sipping wine and nibbling delicious morsels in Aspen, I realized I was a Foodie! I found my tribe!” She immediately went home and Googled “win food and wine festival”, which led her right here to www.cookingcontestcentral.com and a variety of cooking contest resources. The very first recipe contest Merry entered was in the Z’Tejas Southwestern Grill’s Chile Fest Dessert contest. She entered a single recipe and won! Her winning dessert “Chocolate Chile Lime Shooter” was featured on the restaurant’s menu for the following month and she received a private dinner for 10, prepared by the Z’Tejas Executive Chef. As a competitive cook, Merry’s biggest wins have included three $10,000 checks, a $25,000 check, and a trip for two to Scotland! Three continents, seven states, 25 live cook-offs, countless recipe contest wins, and over $130,00 in cash, travel, and prizes… the rest is history! Today, Merry can be found in her Santa Clarita, California kitchen, creating a tasty new recipe, tackling a challenging contest, or cooking up a delicious meal for family and friends. A hands-on grandma, Merry especially loves welcoming her grandkids into the kitchen and passing along her love for cooking with Hadley, Olive, Frankie, Cassidy, Jeremiah and Baby Grayson. Step into my kitchen. You are welcome in my home. Come sit at the counter and I’ll make you a warm bite. Let’s talk about the week, our dreams, adventures, hardships and blessings. Stay for dinner… there’s always room for one more at my table! Step into my kitchen and share a slice of this delicious life with me.